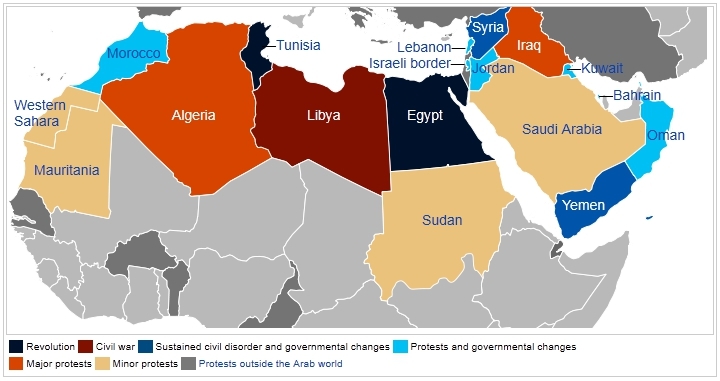 What About Cynics: The Arab Spring: Over One Quarter of a Decade Later. When the term Arab Spring was first used over two and a half years ago, I was unable to walk and thoroughly bed-ridden, the only passing relevance this has is that during that time I was able to track ever part of the beginning of Arab Spring from my room, unable to do much else at the time. The name itself invokes the idea of a quick transition, starting in the December/January and ending, it was hoped, before the Summer. Two quite bitter Winters later and we are still here. Obviously covering Arab Spring as the Historian I claim to be is near pointless. This, more than ever, is trying to surmise the story before it is finished. Equally, the achievements of Arab Spring can be so easily reversed, changed and utterly destroyed that to categorically say which have been successes and failures is too heavy-handed. The second country to force their leader at the time, Hosni Mubarak out of power by mass protests that about three weeks, I remember watching as the announcement of his resignation was broadcast to the square in mid-February. The celebration now seems quite bitter-sweet to me, with the tenure of the Muslim Brotherhood being controversial under Mohammad Morsi. Now with the deposition of Morsi and the hideous spiral of violence that has occurred over the past weeks in Egypt, with everything from Mosque sieges to Prisoner execution, means that the hopes for a quick resolution to Arab Spring embodied by Egypt to begin with, now see it in risk of becoming the long drawn-out process that became synonymous with Syria. If there is an Arab country that I would claim has seemingly (once again I am not an expert) from Arab Spring, the original spark of Tunisia would probably be my candidate. The immediate revolution itself having less than 500 casualties and ending within a month, the successful and largely (though not entirely) uneventful elections thereafter and a restoration of such trades as Tourism and an (on the face of it) level of stability. Tunisia seems to have benefited most from the regional event it accidentally set off. For many of the older generations at time of writing, Muammar Gaddafi was not only the face of the Arab Dictators, but also of "3rd world" tyrants at large. Eccentric, decadent and verbose, he had ruled for over 30 years. Even now, even for me, it is weird to think that soon he will have been dead for two years. Overthrown in a Civil War that, as far as I can recall, ended surprisingly quickly after a perceived stalemate was reached and Western Intervention in terms of the famous "no fly-zone" occurred. I've talked to an alarming number of peers who think the Libya Intervention was a model display of how Intervention should be handled. While technically neither fully Arab nor part of the Middle East, the Mali Civil War that was recently resolved via intervention from France into it's former colony is a perfect example of the dangers that were omni-present in the minds of many Arab-Spring onlookers. The heavily armed Tuareg's that had been fighting and armed in the Libyan Civil War took that training and firepower back home to native Mali and nearly took over the entire country, resting for a long time at roughly 2/3rds. Such militarisation of civilian populace is definitely the concerns that nations like Israel have in mind when the instability started. I could, and perhaps should, write an article article on the Syrian Civil War, which as of writing is entering into the 31st month of conflict I believe. The most costly aspect of Arab Spring in terms of both life and infrastructure. The nation of Syria will probably never be the same after this conflict, the increased autonomy the Kurds are showing in northern Syria, the absolutely crippled state of the military, as well as the vast amount of money being poured into the war effort not only by the government of Syria, but also by onlookers such as Iran, and more controversially, the gulf states in a sort of shadow war which I have likened to a Spanish Civil War of religion. I would be very surprised if the Syrian Civil War ends without Western intervention by the time I've finished Uni, and with news of 100s, nearing 1000s of people dying in Chemical attacks within the last few days, the situation seems dire. Hezbollah, a Terrorist group which functions more like a working military at some points heavily supports the Assad regime due to Shia Muslim ties. Consequently this has drawn them into the Syrian Civil War as well, with a few Israeli publication printing that over 30% of Hezbollah's fighting strength had died on the battlefields of Syria. As such, the Lebanese organisation has inflicted some of the spillover from said conflict onto it's own homeland, with increasing riots, car bombings and shootings. By now I hope you see the tragic pattern that seems to be occurring. Finally, to conclude what feels like an ill-advised article, Yemen was a case that seemed to happen pretty much in vacuum of any other revolution. Set off at the bottom of the Gulf Peninsula, the President Saleh refused to step down for what felt like an eternity, before loosely giving up power, but still keeping his position as head of the party. After that everything went so quiet for over a year that I've had trouble finding out on the few times I've looked what the effects actually were. The Presidential election of 2014 will be the big test for the legacy of the Yemen revolution, but in the meanwhile, at least the interim government has not been compromised, even if Saleh is immune from prosecution. So yeah, if you read all that thank you very much, probably much more time than my banal writing deserves. I hope at the very least I didn't misinform you, and at the most, slightly informed. Who knows. Perhaps I will go back to my "Funny News of the Week" segment instead, this one has left me quite sad at the state of world affairs. Ahh well, anime next. Everyone loves anime. Stay Cynical. Thanks for this, it was requested and you delivered. I am a complete imbecile about all this, so I assume each revolt is against a tyrannical leader, but does religion always come into it? Is a strong dictator better than a mess of in fighting? Should western nations get involved. Ok, shutting up now. Alas, all questions too big for me to answer. I watched a discussion programme on 'should uk help the Syrian refugees' and 80% of those voting said no. How sad. Things are escalating in Syria with the gas attack. I firmly feel that we should help the refugees but not get involved in the fighting, or join with Obama in any missile strikes. What a mess. Yeah, I was putting off replying until the UN Council meeting today. I don't think (Read: Severely hope) they don't commit to intervention. Trying to help Arabic countries with refugee problems is an incredibly tricky business though, I hope the British Foreign Aid will do its job. Chemical weapons used in Syria and much deliberation, and yet didn't we invade Iraq cos Saddam was supposed to have chemical weapons? Or was that " regime change", I forget.